Having had a quick and fairly traumatic natural first labour at over 41 weeks, I was dreading having to head to the delivery suite a second time despite wanting more children. Having been unable to access a delivery suite until transition the first time, I had seen about 10 different faces during my holding time at A&E, labouring hard and fast from 3cm to 10cm. The lack of continuity of care, of a familiar face, of someone to keep me focused amid the chaos, was very much responsible for the loss of control I felt during that labour. I was doing spectacularly well under those circumstances, yet ended up feeling like a total failure. Perfect first vaginal birth on paper, very swift dilation and no pain relief, but in reality it left us both reeling for a long time. 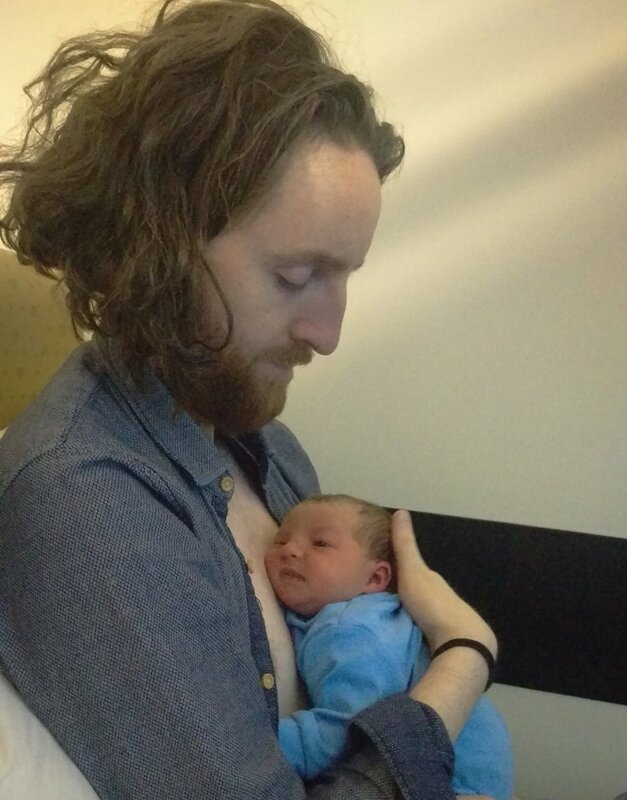 The second time around, I spent 9 months anticipating an even faster labour and delivery and bracing for the chaos, just thankful that Cormac and I would have Jen, our doula, at our side to soften the experience. Nature had other plans, however. At my 39 week scan, despite my body being nowhere near ready to birth, it was recommended that I induce labour immediately as my placenta was failing and had stopped producing amniotic fluid. The combination of low fluids and lack of foetal movement was red flag for the safety of the baby, who would likely survive to full term but be unable to face labour. As a result, I ended up in a bed in the pre-natal ward a few hours later, receiving my first intervention of an intervention heavy birth: Propess. Mentally I was crushed. Having birthed so naturally the first time around I knew my body could do the job if left alone to reach full term and struggled to accept the new reality of induction. Thankfully my husband and doula, Jen, were by my side as I made the final decision to induce, but the shock was so great that I ended up giving myself a temperature out of sheer anxiety during that first night on the ward, once left alone with my thoughts. Little sleep and hours to worry. It didn't help that the baby had decided to pull a few heart rate drop stunts during the afternoon, which made me even more anxious to get it all over and done with. But my cervix was slammed shut and hard, my Bishop score was shockingly bad and it felt like everyone around me was just going through the motions of trying to tease an unwilling baby out, ticking a few boxes along the way, before the inevitable emergency section. I was not at the races at all, mentally, my husband and doula tag teamed to keep my eye on the prize but I had stopped eating through sheer stress. So many times, I came close to requesting a section to end the wait. I was paralysed with fear and mentally exhausted before it had even started. The following evening, the bad news was that the Propess had softened the cervix but not enough to break my waters and had caused a grand total of zero contractions. Natural labour was not on the cards. I had to wait for a doctor to administer a 6 hour action prostin gel, in the hopes of kick-starting some action. At that point, I was told to fast as my cervix was just not co-operating and that it was unlikely that anyone would be able to break my waters the next morning, which meant I was headed for theatre. I'd resigned myself to a section. In the morning however, after some extremely hard work by the doctor on call, numbed by the sweet oblivion of gas and air, my membranes were pierced and the lack of waters was evident. I skipped off to the delivery suite! We settled into the suite and met our wonderful midwife Amy. I hopped onto the bed and demanded the epidural before any further interventions. I certainly wasn't in the mood for sampling oxytocin contractions without drugs at that point. The drip was switched on and the clock started ticking at 12 noon. Jen our doula arrived and we settled in for the final leg of the journey. The epidural was placed slightly to the left, which left my right leg partially mobile and gave me some idea of where the contractions were at as I could feel the tail end of them. It took about an hour for my body to adjust to the epidural, which made me quite sick, but once that was sorted we were able to try various positions including a sitting position with the bed raised like an armchair. Very effective for forcing the cervix open. The peanut ball that my husband picked up in Argos also came in very handy. Chats and banter in the room eventually died down as darkness descended outside the window and the contractions picked up. I stuck on the GentleBirth tracks and zoned out, working through the surges. Suddenly, an almighty permanent contraction pierced through all the pain relief and amidst the searing pain I felt my baby's head fall into the pelvis with a 'clunk'. I started to panic at the amount of pain I was feeling at that point but Jen kept me focused and the midwife hurried back in to confirm that I had hit 10cm! The contraction eased and we agreed to give the baby an hour of passive descent as she was doing really well. She, however had other ideas. The pushing contractions were coming thick and fast and I just breathed through them using gas and air to relax, as the epidural had long been switched off at that point. Jen barely had time to grab the phone to commit her birth to memory, within about 10 minutes she had birthed herself as the midwife rolled out a 'landing strip' to catch her as she flew out. Out she popped at 18:15, without giving me so much as a scratch, warm and crying, for delayed cord clamping and nursing. The relief was amazing. We had made it through, safe baby, safe mammy. We named her Anouk. I drank about 4 litres of tea and ate a loaf of bread in the form of toast, as we chilled and chatted for a few hours before being brought up to the ward. Boy was I starving. There was so very little that was natural about this birth, a veritable cocktail of interventions, yet it was the most peaceful and healing experience. Our delivery midwife, Amy, was outstanding. And having Jen with us helped me find the courage to give this birth a shot despite it not looking like anything I recognised or wanted. I'd do it all again but maybe not tomorrow. Monica and Anouk, with Midwife Amy and Doula Jen. It was Tuesday. I was 40+9 and due for induction on Friday at 40 +12. I had been for my second round of acupuncture the day before and I was super emotional. I had been similarly emotional after acupuncture before, so I was putting it down to that and rolling with it as best I could. I’d been reading up on the GentleBirth FaceBook group about the various stories of induction to try get my head into the right space. We decided to take our 2.5 year old out for a walk in the local fairy forest. I was getting a very gooey doughnut after!! We had a lovely walk (in between my bouts of tears and needing to sit and toddler antics!). There were no doughnuts in the shop after our ramble - nearly broke me!! We got home for nap time and I had a nap too. I was experiencing painful pressure all morning. I’d felt that before so wasn’t concerned. Bounced on my ball for the afternoon and played with toddler as best I could. Went for another lie down early evening. "Our little baby was finally with us and I had an amazing birth experience that I could not have even imagined!" Woke around 7.30 pm and my partner had taken toddler to bed. Realised I was still experiencing the painful pressure and that rest hadn’t changed it. Noticed a wave like motion to it and finally dawned on me that maybe something was happening!! Had some dinner and watched some TV until my partner came downstairs around 9pm. Told him things may or may not be starting but that I’d ring my parents to come up from Tipp to be on the safe side and to get in touch with Debbie our Doulacare Ireland doula. I was very calm, relaxed and a bit excited. I knew it could all stop but was hopeful to meet our baby! We spoke with Debbie and then filled the birth pool that she had lent us. It was heaven. The water took away all sensations between the surges so then I knew things really had started! I rang my Mum again to let her know to come and she was very excited and was already ringing my Dad to come back from his friends to get on the road to us! The pool was great. I just melted in it. We started timing the surges. I used wave imagery during each one and told baby I loved them. We watched comedies on Netflix and took things nice and easy. We were speaking and texting with Debbie during this time. Letting her know what was going on. She was on a postpartum shift and was ready to jump to us as soon as we said so! I was happy and comfortable with being at home. There was no rush on us anywhere and things were going well. Got out of the pool as it was getting cold and the surges were noticeably more intense out of water. Tried my Tens machine which I loved on my first labour but couldn’t hack it this time at all. Getting dressed and warmed up took a while with surge breaks. My parents arrived and settled in around midnight. I packed them off to bed. I loved them but didn’t want a crowd around me. My partner and I went upstairs to our room. My bed and pillows were a gift. Low lighting and chilled but happy labour playlist was ongoing. I had to pee a lot which was annoying! Surges were really taking shape and we were hitting the 4-1-1 mark. They were quite strong, and I held my partner's hand through them. There was quite a sting in them at the end. Just as I was thinking it was ending, there would be a lash at the end – I was imagining a dragon’s tail swishing! We rang Debbie to come around 1am. I was so comforted by her presence. Our team was assembled! Not long after she arrived we pretty much decided to go the hospital. Things were intense and regular. With it being a second labour, we didn’t want to take any chances. My partner was defrosting the car and getting things organised while Debbie and I chatted, and she held my hand and helped me breath through surges and go in and out to the bathroom. Getting down the stairs and down the outside stairs to the car was super hard. Surges were much more frequent with movement. The journey to the Coombe was awful. I couldn’t bear sitting. My GentleBirth tracks were a Godsend during the journey to keep me calm and focused. The Labour Companion track was a perfect accompaniment. I could feel the panic and discomfort ease as I listened, focused and breathed. My poor partner thought we were going to have the baby in the car at the rate the surges were coming! We got to the hospital around 3am. Security got me a wheelchair and brought me in. He was a lovely man and was chatty and funny – I was not interested! I had my eyes closed and tracks playing. I needed my bubble to stay intact and wanted my own quiet space. The Domino midwife Emer assessed me. I was thrilled it was her on duty as we had met at one of my appointments and had really gotten on well and had a great chat. It was lovely that she remembered me. I felt so encouraged and this was another good sign! I was 1-2cm and baby wasn’t fully turned so she wanted me to walk and move to encourage baby to turn. I was offered pain relief but we all felt I was handling it well, so declined. At this stage surges were quite consuming and intense. The thoughts of moving were awful, I just wanted to lie down between surges - not walk and move! Even though Debbie and I had a dance routine all ready to go and even had a song – Kanye “Stronger” mainly inspired by baby being “late” and the lyrics “you should be honoured by my lateness”! There was no hope of me dancing. Made it to the bathroom next door to the assessment unit and sat backwards on the loo. This was so comfortable. And I felt I could manage better there than in the assessment unit. The privacy and space of the bathroom was better than a curtained bed. My partner and Debbie did double hip squeezes and I was using my GentleBirth tracks. We moved between assessment room and bathroom. One of them would do squeezes while the other gave me water/held me after a surge. I tried lying down again between them, but it was too uncomfortable to lie down and was hard to get up for a surge then. I had zero energy between surges, they were taking all my energy. Asked to be assessed again after a while as I was feeling a downward pull. It was 4.30 and I was 3-4cm. The walk to the delivery suite (which of course was at the very end of all the suites – or so it seemed to me) was tough. Every few steps another surge took over. My partner would hold me up during them as Debbie did hip squeezes. Eventually we made it to the suite. I was very glad to have our own space and not to be in the assessment unit. Headed straight to the bathroom to go backwards on the loo again. Things really took off. I was louder during surges now. Debbie got the shower going and set up the chair in it. It was fab to have the water on my back. Not long in the shower and I had to use the bar to pull myself to standing as the surges were so intense. The power of the surges drove me to standing. I felt the need to push. Midwife was called. My plug was coming away. Came out of the shower after that and made it a few steps, got my labour dress on again (I had worn it on my first and got a neighbour to put zips in it for skin to skin and breastfeeding access this time). I thought the intensity and pressure would lessen after the plug came away but nope! Got helped to my knees just outside the shower and bean bag out under me as I went on all fours. My partner knelt in front of me and held me up as I had nothing left after surges. Debbie was holding a cold compress to my forehead. Emer the midwife was McGyvering on the floor behind me with her doppler. I hit a classic transition where I didn’t know what was going on, what was happening, why it hurt and stung so much, how I couldn’t possibly do this. My partner and Debbie were so encouraging telling me I was amazing, and all was ok, and everything was normal. It really eased the fear that had gripped me. The midwife asked me if I wanted to know what was happening – which I did. I honestly was asking if I was pooing or having a baby! I could feel my whole pelvis shift with the surges and I could only roar my way through them. Emer told me that my waters were bulging and that was what was causing all the pressure. Once they went I would feel it less intensely. That helped so much to know and understand what was happening. I could relax more now. It soon became clear that baby was coming in the sac – rare but normal as the midwife said. Midwife, Debbie and partner told me to keep doing what I was doing, to follow my body’s lead, to go with the surges. It was properly intense, and the power was unreal. Baby’s head came in the sac. The sac burst, and the rest of baby came. We could hear the baby crying – it sounded like they were underwater! A singing mermaid! The relief and joy were epic. I couldn’t believe what had just happened. It was 5.10am. Emer got Debbie to get a towel to give baby a quick wipe and she pushed baby up through my legs, so my partner and I could see baby – we had a daughter! It was such a wonderful moment to discover our little one together. The place was quite a mess, so we got to talk and kiss our little one as Emer cleaned up some so that I could safely stand and get to the bed. I got to carry my precious bundle with the cord still attached, to the bed. We had delayed cord clamping, feeding and lots of skin to skin time. I couldn’t stop smiling. I was blissed out! It was a surreal experience! I needed stitches for second degree tearing. My partner got skin to skin with baby and Debbie held my hand and rubbed my head during the stitching. I was so grateful for her. She kept encouraging the gas and air too – which was great! I was on every kind of high and joy. Tea and toast arrived but I wanted to shower first. Debbie helped me while my partner held baby. Coming out of the shower I felt very woozy, so Debbie held me. I fainted, and midwife came. We had to manoeuvre me to a wheel chair and to the bed. I fainted again going from the chair to the bed. Rob had put baby in the cot to try help me. Once I was on the bed I felt much better and inhaled tea and toast. I should have had them before the shower. My poor partner had an awful fright – I missed all the drama! We got to chill in the suite for a good while. Debbie held baby while my partner and I had some time together. She then helped my partner sort the bags for the ward and stayed with me while he went to the car and swapped bags around. I was so sad when she left. She had been such an incredible support to us and had been a massive part of our wonderful experience. My partner and I were and are so grateful to her. My parents and toddler got to come in and visit us later that afternoon, which was fantastic. Big sister was thrilled with little sister! It was a very precious and squishy moment when the girls met. Debbie had given us great tips about introducing the sisters and they really made a difference. We had to spend the night on the ward as baby hadn’t done a wet nappy – she finally did at 10pm but it was too late to head home. We did get to go home first thing the next morning. I could hardly sleep I was so happy and the midwife on the ward commented on how radiant I was!! Our little baby was finally with us and I had an amazing birth experience that I could not have even imagined! The doubt and fear I experienced during the 40 minutes in the delivery suite before my little girl arrived was totally wiped away. Awe of women and what we are capable of, replaced it. Gentle Birth was a marvellous tool during pregnancy and labour. Listening to the tracks all along really helped when action came as my body responded to the familiar words. Having a doula was significant for me throughout the pregnancy, labour, delivery and postpartum experience. The continuity of relationship meant she was a brilliant support when the time came. Trust had been established and I knew she had my best interests at heart and was there for me, my partner and baby. Our team brought our precious bundle into this world in the most incredible way. It was a transformative and empowering experience for me that I wish everyone to have.